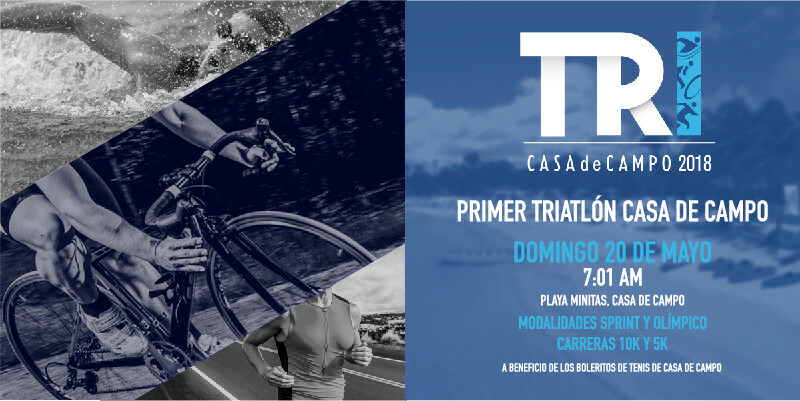 CASA DE CAMPO’S FIRST TRIATHLON COMING NEXT MONTH! The first ever Triathlon in Casa de Campo is coming next month! Are you prepared? This triathlon will have competitors swimming, running and biking around Casa for the gold! Triathlons test a contestants endurance with multiple disciplines following one another in sequence. Talk about a work out for mind, body, and soul! The Triathlon will take place on May 20th, and will benefit the Tennis Center’s Ballboy Foundation. Starting at 7:00am, the race is predicted to last until 11:00am. There will be two different models, a sprint race and an olympic race with 5K and 10K tracks. Marking and the transition zone begins at 5:30am and ends at 6:30am for all categories. There is no registration the day of the event so be sure to sign up and start training ASAP! The Sprint race will include swimming 750 mts, biking 20 kilometers, and running 5 kilometers. The Olympic race will be swimming 1,500 mts, biking 40 kilometers, and running 10 kilometers. Both are sure to be intensive so be sure to get plenty of rest, nutrition, and water before starting! The races begin roughly a month from now, so start training and get ready for the first competition of its kind in Casa! For more information: please call the Tennis Center office, at 809-523-3333, ext. 5940. Tango concert with Sergio Logioco at The Living Room by Good Vibe!